Buddhism History - What is the history of Buddhism? 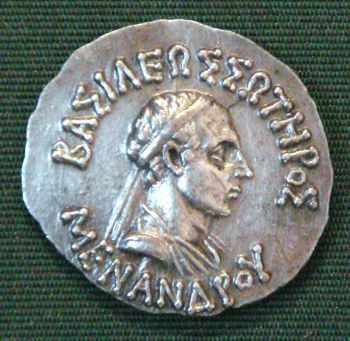 Indo-Greek King Menander is believed to have converted to Buddhism in the 2nd Century BCE. This is recorded in the Milinda Panha (a Buddhist text from c. 100 BCE). He is said to have become an arhat (a perfected one who achieves nirvana). Siddhartha Gautama was born in the royal family in Lumbini in Nepal. There is some debate about the date of his birth between different schools of Buddhism, and among historians. The traditional dates given for his birth are either 563 BCE or 624 BCE, although some historians have proposed a more recent date (c. 490 BCE). Buddhists agree that as a young man, Prince Siddhartha left the palace for the first time and saw the Four Sights (an old man, an ill man, a dead man, and a holy man), and was shocked since he was unfamiliar with age, disease, or death. Subsequently, he lived with three ascetics and became a religious teacher. After a few years, Siddhartha gained enlightenment. 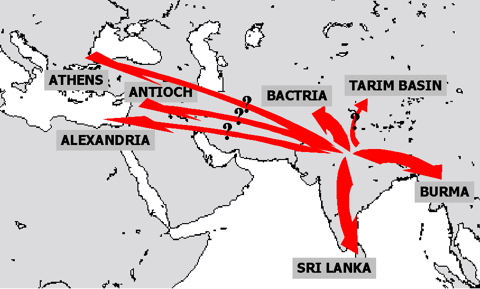 After Buddha's death (attainmentof parinibbana), Buddhism at first spread only slowly in India. The Mauryan Emperor, Ashoka the Great (260-218 BCE), however was a great supporter of the religion. As a result of his efforts, Buddhism was spread throughout his empire (covering most of modern day India), to Afghanistan and Central Asia, and to Sri Lanka. The Theravada school of Buddhism subsequently spread from Sri Lanka to Myanmar, Thailand, and eventually, Indonesia. The Dharmagupta school of Buddhism spread to Kashmir and Afghanistan. Buddhism reached China in the 1st or 2nd Century CE, bia the Silk Road from Central Asia. From there, it spread to Korea and Japan. Vajrayana Buddhism (also known as "Esoteric Buddhism") reached spread to Tibet and Mongolia. in about the 8th Century CE. Buddhism eventually went into decline in India, and almost became extinct in that country. However, it has now of gaining adherents again, largely because of revival movements such as the Dalit Buddhist movement. Buddhism also increasingly spread to the West since the 19th Century, in part because of the influence of intellectuals, in part because of immigration, and in part because of greater contacts between East and West.